The Aligoté grape has been grown in Burgundy since the 17th century. Whether grown in Montagny, Chorey-les-Beaune or Saint-Bris, it normally produces highly drinkable wine that reflects the diversity of Burgundy's myriad terroirs. 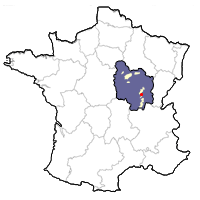 Bouzeron is one appellation in the northern Côte Chalonnaise devoted solely to Aligoté, having been officially recognized by the INAO in 1937. Aligoté generally does best when planted on limetone soils, or limestone mixed with marl or clay, and when grown on gradual slopes at higher altitudes. Today Aligoté accounts for 6% of total plantings in Burgundy. It is a vigorous white grape, and its grapes are larger than those of Chardonnay. Aligoté can be a simple wine, with apple or pear-scented fruit combined with notes of flowers and minerals. Some have referred to it as the "Muscadet of Burgundy" (although perhaps Muscadet is the Aligoté of Nantes!). While widely present within the region, most people in Burgundy don't regard Aligoté as being agreat wine. In fact, it is the unanimously recommended wine for kir (white wine mixed with crème de cassis) — a delicious apéritif in its own right but one that often masks the taste of mediocre whites. That being said, the Aligoté wine of Burgundy can be excellent, with bright fruit, seductive floral notes, and a crisp, clean finish. It makes a wonderful partner for oysters, gougères or escargot. Regionally, its hand-in-hand match is a cold ham with parsley dish called jambon persillé.